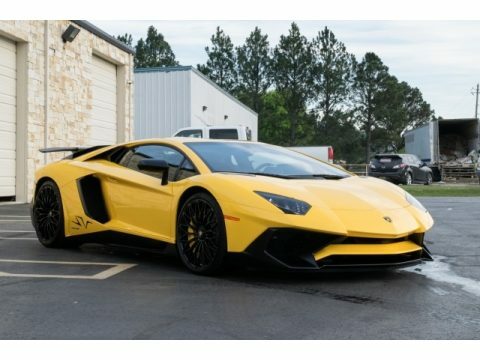 2017 Lamborghini Aventador LP750-4 SuperVeloce Coupe For Sale in Huntsville, Alabama 35811 Get ready to prove the adage true, Float like a butterfly, sting like a bee, with this 2017 Lamborghini Aventador LP750-4 SuperVeloce Coupe! This two-door super sports car encompasses every element of the "Design to Weight" concept supplied by the Aventador marque. It has been dressed in New Giallo Orion paint and complemented by a luscious black leather interior. Powered by a 6.5 liter V-12 engine that is naturally aspirated and mated to an automatic transmission, this vehicle is ready to unleash the ideal combination of power and performance! With only 26 miles you can rest assured that this SuperVeloce Coupe will inspire your passion towards the arcane of Italian-crafted, mechanical wizardy for which the Lamborghini nameplate is known! Options include X-Frame and T-Engine, Dianthus 20/21 Forged Wheels, Fixed Rear Air Intake, Transparent Engine Cover, Lamborghini Sound, Electric and Heated Seats, Footplate in Carbon Fiber, Yellow Brake Calipers, Branding Package, GGT, Rear View Camera, MuFu Steering Wheel, and Garage Door Opener. This 2017 Aventador SV comes fully loaded with options and features that are perfect for anyone who expects the most out of life. Highlights of its advantages include ultra-lightweight carbon fiber used for air vents, rear spoiler, and bumpers, as well as Alcantara interior upholstery that provides the epitome of luxury and quality. However, what makes the Aventador SV unique is its impressive dynamics. Each component has been carefully selected to obtain maximum performance with as little weight possible. It features a maximum power output of 750 CV and full control in all weather conditions, thanks to its various preset driving modes: STRADA, SPORT, and CORSA. With electronically controlled four wheel drive, supported by the Lamborghini Dynamic Steering and magnetorheological push-rod suspension, you can rest assured that this Lamborghini is like no other. This 2017 Lamborghini Aventador LP750-4 is brand new fresh off the lot with only 26 miles on it. This vehicle has not been driven. It is properly stored inside . This Aventador is a must see/drive to truly appreciate everything it has to offer. In fact, come see for yourself! You will agree that you cannot find another 2017 Aventador SV Coupe in this condition for the asking price. The owner has had the car less than three months, and the only reason for selling is due to a change in plans, which makes this dream car a reality for the right buyer. Don't miss out on this amazing opportunity! Call today for more information on how you can feed your need for speed, all while turning heads, in this 2017 Lamborghini Aventador!! !